Starshatter: The Gathering Storm Goes Open Source! Now You Can Play Starshatter for Free! Edit: Starshatter Mods seems to be down, so if y’all find this story and still wanna download the game, you can over on SpaceSimCentral. Thanks for visiting! 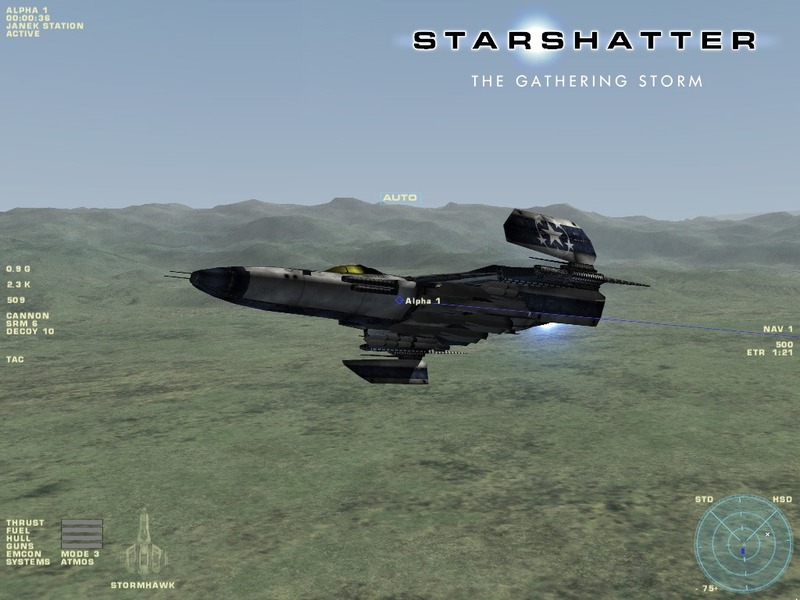 14 DEC, 2011 – STARSHATTER:THE GATHERING STORM – Open Source Version 5.0.5. This download Includes the cumulative Starshatter-TGS game up to version 5.0.5 (No CD Required). It is available for download from our “Lagacy Official File” section. If you’d like to try this excellent sim, head over to StarshatterMods, register an account, then head to the Downloads to download the entire game. Enjoy! Ah finally I get to try this..thanks. Awesome! Have you played SS before? Nope, i tried it for the first time today and I just didn't get the hang of those controls. Eventually I closed it but I'll probably give it another go in a few days. Yeah, it's one of the more hard-core space sims, more akin to a detailed flight combat sim than a traditional space sim. It's worth sinking your teeth into, as it's one of the only space sims of its type with such a level of flexibility — thanks to being able to fly different craft, from fighters to bombers to carriers — and replayability, thanks to its amazing dynamic campaign, which is very rare in space sims. Good luck! I agree. Starshatter is a rather hard-core space simulation and not for the casual player. It will take some time and skill to become a competent Starhstatter commander. This is as it should be for such a simulation. Oh, no cheat codes are available either. One will have to earn ones command rank. Ohhhh, nice! I'll put this in my next round of snippets! Thanks! Has anyone here heard from Wdboyd at all? Starshattermods has been down for over a week now, and I am unable to contack Wdboyd. If anyone has any info and can pass it along, I’d greatly appreciate it. Welcome to the site Brad! Sadly I don’t know the Wdboyd at all, sadly, but maybe someone here does? Thank you for the welcome, Brian. Haven’t been able to contact Wdboyd either. Do you have CaptainX contact info? No I do not have contact info for captainX. Do you happend to know how to get ahold of him. I’m starting to get a little worried about William. I hope nothing happened to him. Yeah, can’t see it up here either. If necessary, I can put up some zero-effort Mediafire hosting for the base game and required mods. Just say the word. It’s on Space Sim Central, so that should be okay for now. and we will be sure to include you in any discussions. Holy crap what a mess. Thanks for the update! Hah, a SW total conversion would be freaking amazing. Who knows, now that it’s open source it might just be a matter of time. Glad you found and are enjoying it. It really is a little gem of the genre.